On Saturday September 5th, Mongoose is throwing open its doors for fans of Traveller. Taking place at our offices in Swindon, it is completely free to attend, and everyone is welcome, whether you have played Traveller before or not! Doors open at 9:30, and games begin at 10am, finishing at 5pm - and we have some special games lined up for you! Rumble at Bay 13: It's your ship, so no one's going to take it from you. A miniatures skirmish. Judge Dredd: Enforce the Law in the world's most violent and crime-ridden city. Masks: Settlers are on a poor frontier planet under the watchful eye of the Imperium. What could possibly go wrong? Seek and Destroy: Take the part of Elite commandos rescuing hostages on a starliner. Strontium Dog: Be the first to take part in this new setting for Traveller, where everyone plays a mutant bounty hunter. Noble Blood: A noble retinue searches for a family heirloom. Cold Dark Grave: You have one last chance to make enough money to keep your mining company running. As always, the Mongoose store will be open all day, giving you the chance to pick up the latest goodies for Traveller and our other games. See you there! BITS are supporting this. As a sneak preview of the next Member's newsletter, over the next week or so we'll be posting a review of Mongoose Traveller in the Member's section. BITS is also looking for reviews of Mongoose Traveller, Traveller Hero, and the new Traveller 1248 Book 3 - The Spinward States. If you're a member, we'll probably add them to the newsletter, but if you like we can add them here to the site too. Alternatively, please send them to RPG.net and get Traveller some publicity! Just like the Traveller Book - ignore my cable mess in the background! We'd welcome your reviews and comments to go in the BITS Newsletter! If you haven't heard, Mongoose Traveller is available this week from all good stores! This is the core volume around which Marc Miller's Traveller 5 is being built. You can find details and previews here, on the Mongoose Website. We would be delighted to have reviews for the BITS newsletter, and would also encourage to send your reviews of this (and BITS products, obviously) to sites like RPG.net. Mongoose have just announced that they have sent Traveller to the printers for publication. As this isn't using the in house printing that flawed the production quality of some of their recent books, we'll have to wait for nearly a month! Thanks to Richard Talbot for spotting this! The UK's Mongoose Publishing are going to be the new publishers of Traveller. 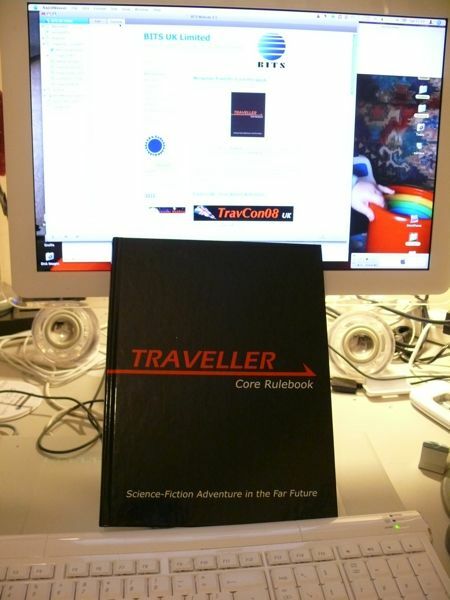 After a near 10-year gap in which only reprints of the Traveller game system have been available, Mongoose Publishing becomes the centralised resource for Traveller titles with the publication of their core rule book Traveller: Science-Fiction Adventures in the Far Future, in February 2008. On this foundation, Mongoose will produce a supporting line of supplements, adventures, and sourcebooks detailing the official and original Traveller universe of the far future. The materials published by Mongoose will be placed in and part of the canonical Traveller universe. It is our aim to halt the fragmentation of the Traveller game, and reintroduce one solid system (based on Classic Traveller), with one source for the official Traveller universe. But that is not all. . .
Mongoose will also be using Traveller in its licensed science-fiction properties (each featuring a Traveller logo). We have pioneered this concept already with Runequest, publishing a rules set and supporting adventures and sourcebooks, then using the Runequest rules as the basis for other alternative fantasy role-playing settings, such as Hawkmoon, Elric and Lankhmar. The first licensed setting to be produced using the Traveller rules set (and available in early 2008) will be Starship Troopers, a welcome return to bug-blasting action across the galaxy! Hot on its heels will be Strontium Dogs, based on the hit 2000AD comic strip. After that, who knows. . ? To the greatest extent possible, we intend that there be a transportability of characters, concepts, and even equipment between the various systems. So, it will be perfectly possible for your Strontium Dog Bounty Hunter to land on a planet in his Scout/Courier, only to find him battling for his life against waves of Warrior Bugs – with no conversion needed between the games! All games and settings will therefore be able to utilise the core supplements, such as High Guard, Mercenary, and 760 Patrons, while retaining their own character. Once the rules for Traveller appear, we plan to make them available under the Open Gaming License (OGL). At the same time, we will issue a Traveller Logo License (TLL) which makes the Traveller logo and titling available to licensees. 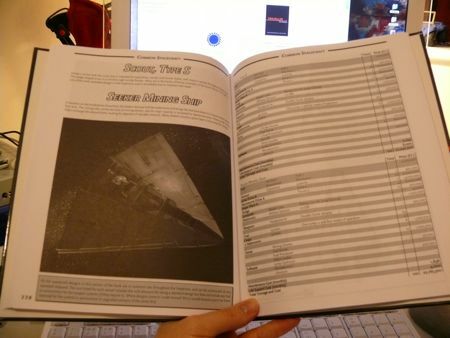 Far Future is proceeding with plans to produce the long-heralded Traveller5, initially as an extensive CD ROM package (estimated at 1000 pages) by the end of 2007, and a distilled 350-page Traveller5 Core Rules book in the first half of 2008. T5 will be a superset of the Mongoose Traveller rules, providing detailed coverage of rules, concepts and history not available elsewhere. There will be cross-compatibility between Traveller and Traveller5, allowing you to use rules and supplements from each. Traveller will be faithful to Classic Traveller, with an upgraded task and combat system. Traveller5 will be a superset of those rules, providing greater detail and more insight into resolving situations in Traveller.